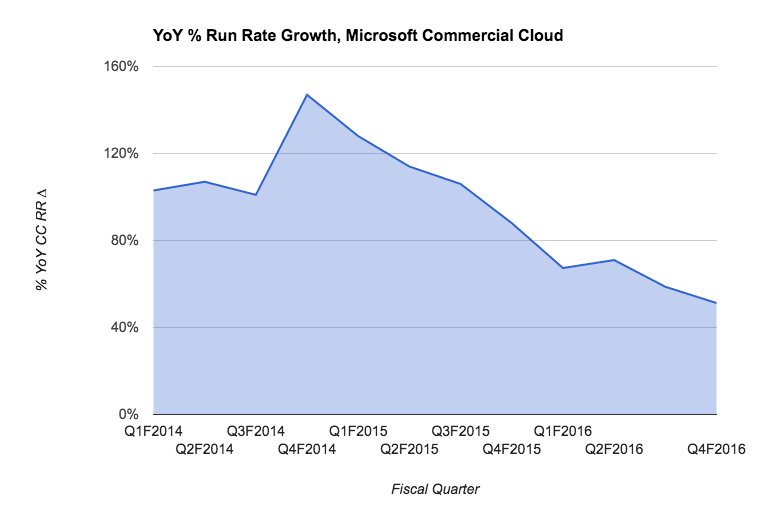 Editor’s Morning Note: Microsoft will likely keep its promise to grow “commercial cloud” revenue to a $20 billion run rate by the middle of 2018. Shares of Microsoft are up more than six percent this morning on the strength of the earnings report it handed in after the end of trading yesterday. The firm beat expectations on adjusted revenue, and adjusted profit. Microsoft also notched nearly a billion dollars in Surface revenue, doubled Azure top line, and kept growing its recurring Office business. However, the company’s commercial cloud revenue is the key to understanding its performance. Let’s take a look. Microsoft expects revenue from its commercial cloud1 business products to pass the $20 billion run rate mark in its fiscal 2018, which runs through the second half of calendar 2018. Microsoft made the promise as a line in the sand, a note to investors that it is serious about the cloud. How are things progressing? 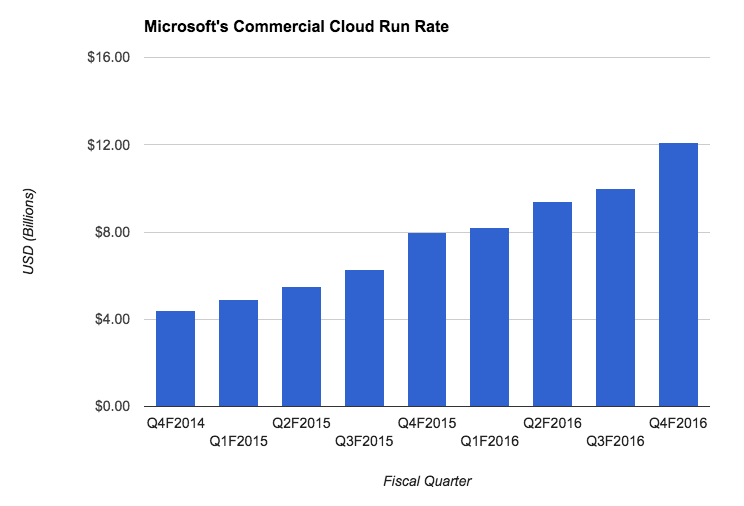 In its most recent quarterly report, Microsoft indicated that its commercial cloud’s annual run rate had reached $12.1 billion. That’s up from a $10 billion figure given in the preceding quarter, and an $8 billion figure in the comparable year-ago quarter. Your astute eyes are correct; the last quarter was a strong period for Microsoft, just as the sequentially preceding quarter was not. However, while Microsoft has nearly tripled its two-years-ago commercial cloud annualized revenue pace, the percent gain that it notches each quarter is in retreat. Why? Because if you hold new dollar accretion on the revenue side of things flat, the percent gain on both a year-ago and sequential basis declines. This is an example of why charts can be confusing. Microsoft’s most recent quarter looks the weakest on the second chart, where it picks up last place, while in terms’ of raw dollar growth it was Microsoft’s best quarter we have data for. Will Microsoft make it across the $20 billion dollar run rate mark by the end of its fiscal 2018? It seems so. Thinking broadly, Microsoft is now just into the first quarter of its fiscal 2017. That gives it two years to wrap up this $20 billion bet. And, the company is 60.5 percent of the way to complete, of which it picked up just over 10 percent in the most recent quarter. If you subtract 12.1 from 20, and then divide the result by 8 you end up with a figure around 1. That’s a billion dollars per quarter over the next two years. Doable? Yes. Microsoft averaged something close to that pace in its now-concluded fiscal 2016. That Microsoft should be able to reach the $20 billion run rate figure is important as Microsoft recently announced that it will not be able to reach the billion Windows 10 device goal that it had also announced. The company’s new phone strategy put the round number out of reach. More notes from prior reporting. Top GIf From Comedy Central on Tumblr, Via Giphy.